so this is hers need to do a box my inspiration came again from my lovely lad Inger hardman whos gallery is so very beautiful and has me mesmerised every time i visit i saw she made a card with this cute girl and i just knew i had her somewhere....on my computer amongst the 5000 or so i have saved....but could i find her no ..have been searching for hours and their she was..so credit goes to Inger really i just did my twist...added white Christmas berries and crystals especially on her headband added my own sentiment pearl pins..lace..cheesecloth and some silvery foam stars in my Christmas bag of bits the added a pearl to them i have used feathers to and a charm i painted white with a rose from wild orchids..a ripped Christmas song sheet..a couple of bows..so i hope you like her but isn't she the cutest..that angelic face...ive never used her before but i do have loads and perhaps it was meant to be her turn today....love and leave you all of to try and do some tyding up and get Henry out ..that will frighten the cat...not so sure if its not me shouting at the hoover trying to get it round the rooms or the noise...its probably me that makes the most noise lol!!! happy Monday..ttfn loved reading yesterdays comments too really perked me up...mwah!!! sassy hugs xxxxxxxxxxxxxxxxxpopping her into http://bunnyzoescrafts.blogspot.ca/ whi asking girls girls girl well shes a girl and a pretty one too .. Thanks for giving me a chuckle about your washing!!! Love this card. Beautifully designed and nice soft winter color. Have a nice week. Oh girl, this is just so beautiful! A white Christmas indeed! I am putting in my order to Wild Orchids and know some of the items I just must pick up. There is not one thing on this card that does not say 'I am beautiful - and Dear Sister I made is especially for you with my love over flowing from my heart!' 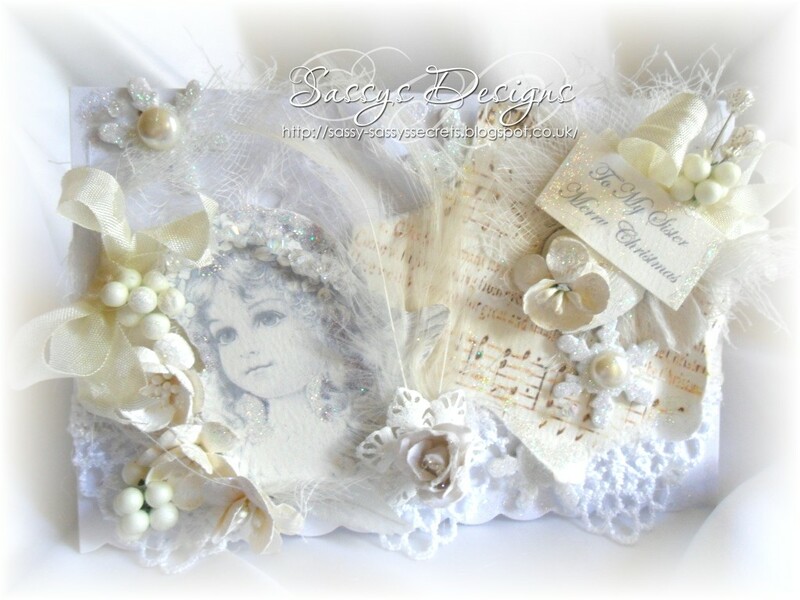 Your sister will love it as this card truly is priceless and so,so,so beautiful, Sassy!! She will just love it!! Blessings, dear Sassy. Keeping you in my prayers all week! So happy to feel positiveness and happiness coming through your blog! Another gorgeous and stunning card. 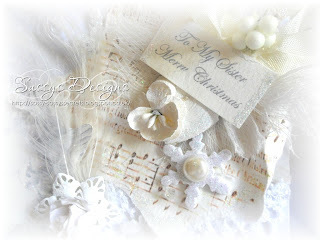 I love the idea of all white for Christmas. Your sister will be thrilled. h my word this is mesmerizing totally and utterly gorgeous Sassy your Sister will be overjoyed when she sees this magical card!!!! Wow!!!! 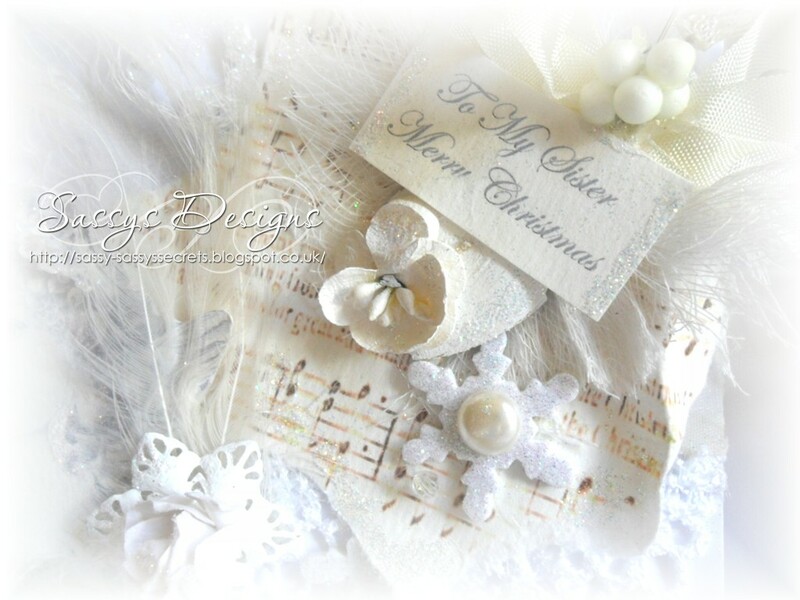 This is one of the most stunning Christmas cards I have ever seen! It is beautiful. 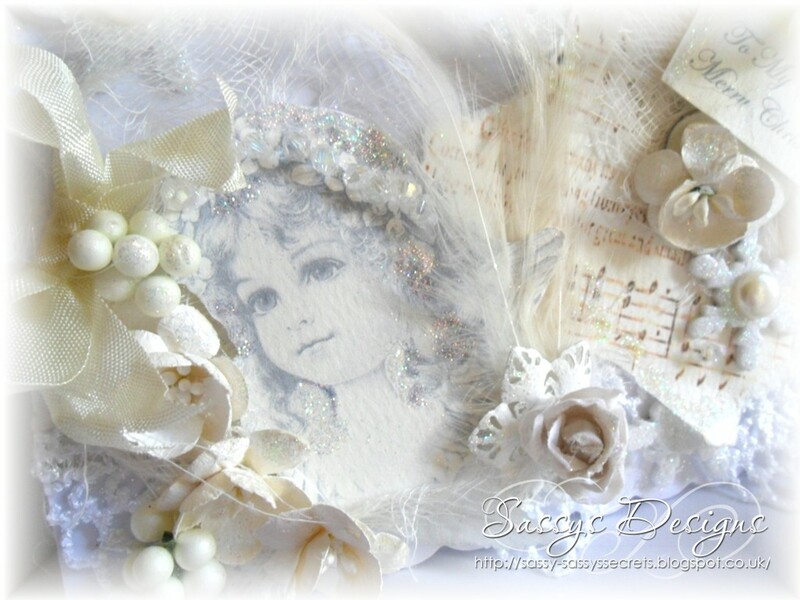 I love everything about it, the white on white, the pretty vinatge little girl, the embellishments! Your sister will love it. Well done on getting a head start on your Christmas cards too! A gorgeous card. I love the flowers. another stunning card Sassy - and aren't you the organised one doing a Christmas card in June...? lol! I must try and do a few soon! Oh this is so dreamy! I love it! your Sister will be so thrilled to get this beautiful card. You are funny, crows nesting in your bra heeee..hee. Wowwwww stunning card again Sassy!!!! Loving that image too and whites on whites! !